So what?! So let's dance!! 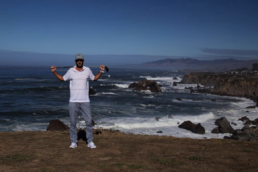 G&E Magazine aims to deconstruct the journey that golfers and entrepreneurs alike take on their road to success in the world. Their achievements, as well as their trials and tribulations, serve to inspire us. Our goal is to pass that inspiration along to our readers. 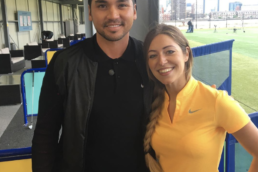 We hope you enjoy our feature this week with professional golfer and entrepreneur, John Billin from Ampcaddy! Sure, Matt. I grew up in Simi Valley, California. I was a serious soccer player… won Division 1 CIF titles twice and had aspirations of playing at the next level. Unfortunately, a car accident ended my soccer career. But, my first job in the golf business was in 1998. I was a cart attendant at Wood Ranch country club. Sorry to hear about the accident. So, when did you start playing golf? Any specific reason you picked it up? Well, because of my accident, I became friends with my parents’ neighbor – a scratch golfer – who was always going to the course to play and practice. I broke my back in the accident, so I couldn’t really swing… so I learned golf backwards. I learned how to putt, then chip, then pitch as opposed to most people who would go to a driving range to try learning by taking full swings. I fell in love with the game and turned professional in 2000. That must have taken some serious patience. So shifting gears to your business venture – what made you want to start Ampcaddy? Good question. Before I got into golf I installed custom car stereo systems. I have always loved music and sound quality. To this day, I still customize my cars and home with high-end audio equipment. When golfing, I would throw the bluetooth speaker in the cupholder, cubby, or back basket of the cart. I got frustrated spilling on my speaker, having it rattle around the cubby or basket. The sound would get muffled, so I wanted to come up with a better way. Seems to be a common theme with entrepreneurs… we want to scratch our own itch. Tell me a little more about the name “Ampcaddy.” How’d you pick it? We designed Ampcaddy to mount and dismount easily to any golf cart in seconds as well as have directional capabilities to move left to right giving you the ability to direct the sound. Having the ability to mount the speaker on the cart at ear level does several things for the listener. First, you do not have to play the music as loud as you would as if it were in the cupholder, cubby, or basket. Also, with the speaker at ear level, there is nothing to block the audio. 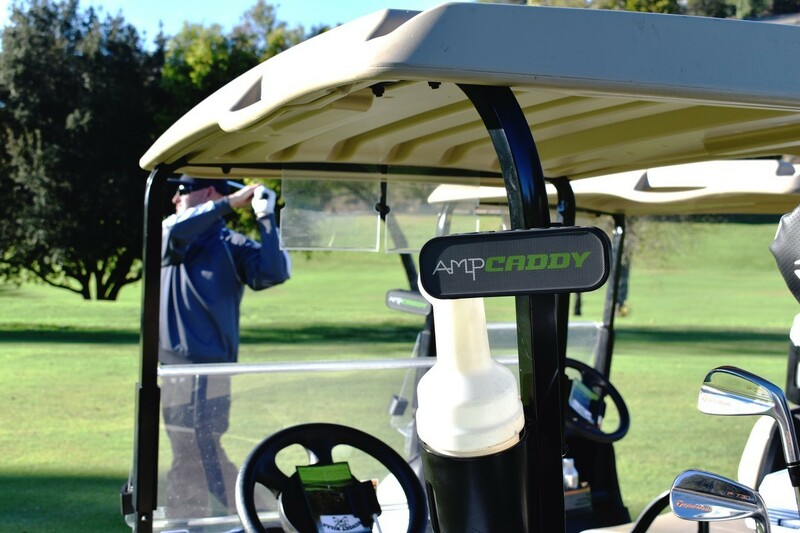 Sound is directional, so having the ability to point the speaker towards you on the tee or green is another way Ampcaddy provides an advantage. Similar to a good caddy, Ampcaddy is low-maintenance but can be heard when it counts. Very cool. Have you engaged in any other entrepreneurial ventures prior to Ampcaddy? I guess being a professional golfer, you manage your clientele and schedule. But to say that’s anything close to running Ampcaddy… it just doesn’t compare. Right, different types of challenges. Have any doors opened for you as a result of launching Ampcaddy? For one thing, social media. I’ve learned a tremendous amount about how to use social media effectively. Promoting, selling and communicating through social media has been a huge part of what we have done and will continue to do. We’ve also been in contact with some amazing brands who are considering creating a branded version of our speaker. That’s fantastic. So, what’s your vision for yourself and your company in the future? I love the game. I think it’s facing some challenges right now and needs to become more fun, inviting and social. Music just happens to fill all of those voids. 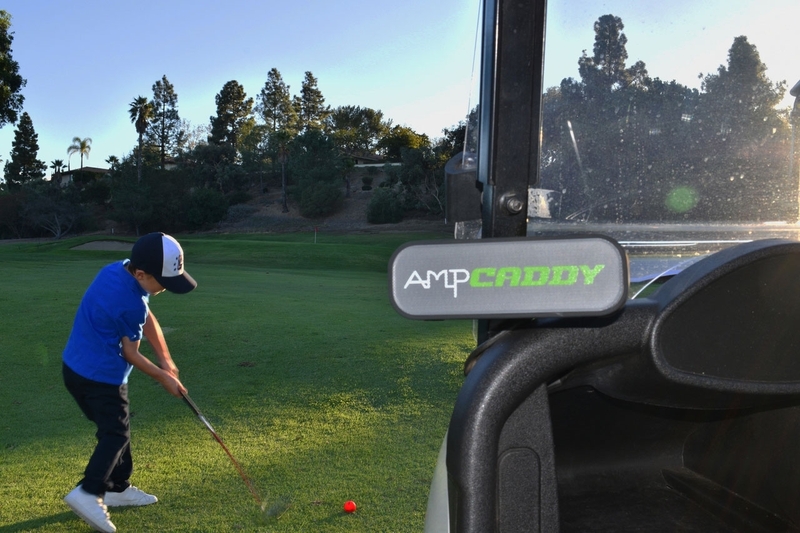 I would love to see Ampcaddy grow the game of golf. It could change the perception people have about the sport in general. Golf doesn’t have to be uptight and stingy. It is okay to go out and just play for the love of the game. Play to have fun. My goal is for golf and music to become synonymous with Ampcaddy. Great answer. We can all use a reminder that we’re out here chasing that little white ball for fun. So, what have you learned most from starting Ampcaddy? Wow… I’m not even sure where to begin. This will sound cheesy, but honestly? Patience and trusting the process. You make it sound so simple… how does Ampcaddy engage with the community? We try to support a lot of charities and help as many people as we can with their fundraising. We will continue to enhance our involvement in the community as we grow. Glad to hear it. So I’m going to change the pace a bit – ask you some rapid fire questions. Who or what is your greatest inspiration? My wife. I have an amazing wife who has always supported my crazy ideas. And my son. They are my world, and I try to do everything I can for them. That’s truly admirable – it’s all about family. So, what’s your favorite time of year to play a round? And to get a little specific… time of day? You can’t beat a late afternoon round in the summer in Southern California. Sounds unbelievable. And if you could play 18 with anyone…? Can’t knock that. Besides Ampcaddy, what golf-related purchase have you made in the past year that you are most excited about? Coors Light definitely counts. So, as an entrepreneur, what tools… mental or physical… do you use to get focused or maintain focus? I’m on the phone a lot. So, I use a lot of apps to help me stay organized and on task. Everything from Spotify – so I can listen to music which helps me focus – to Dropbox, Google Docs, etc… As I mentioned previously, I work on a lot of social media. So there are several apps that I use to help me with either organization or creation of content for online platforms. I also use these as sales tools to find buyers, wholesalers, sales reps, etc. I’ve never been a guy who liked sitting at a computer so it’s nice that these tools exist and I can utilize them on my phone. It allows me to be flexible. Work-life balance. Being able to work from anywhere definitely has its advantages… and disadvantages sometimes. How do you structure the first hour or two of your day? Looking for a morning routine of some kind. Mornings are pretty mundane. Social media, emails, phone calls… I try to spend as much time as possible with my partner discussing any and all items. Afternoons are order fulfillments, sales and more outbound business. Awesome, John. We appreciate your time today, and thanks for all the insight.